In her Ted talk, Social Media and the End of Gender, Johanna Blakley, the Deputy Director of the Norman Lear Center, does not so much predict the end of gender but more so the end of media created stereotypes of gender. She believes that social media will “free us from absurd assumptions about gender.” She believes this change is possible because social media transcends the old demographics that media corporations use to sell culture back to us. Through social media, people aggregate according to interests and values rather than overly general categories of age and gender. She points out that, worldwide, women outnumber men in use of social media technology, which could drive a change in the media landscape. What’s interesting for our discussion is her analysis of how companies are beginning to look at how individuals use social media and the recognition that old media types are being reconsidered in light of how people interact with it. Most importantly, she describes a major culture shift in which members of social media groups, because they aggregate around tastes and interests, no longer needing the help of a media company to navigate the ways in which they spend their time and money. The literacies (digital, numerate, oral) may be different, but the transliteracies (social, economic, political) often transect them in similar ways, depending on cultural context. For example, in recent years we have begun to switch from searching for information in encyclopedias, indices and catalogues to querying the kinds of data collections that existed before books–that is to say, we are asking each other. Social media, as Blakley describes, allows technology to return some level of human individuation. Although media companies still monitor user behavior, they can do so in a more respectful way because they are monitoring actual interests and values and not just making assumptions based on broad demographic categories. Libraries use social media mainly to promote collections and services, but they can also use social media to aggregate students by meaningful categories, such as research interests, rather than overly broad categories like “millennials,” which may do more of a disservice to students by not exploring a more insightful understanding of their interests and values. Slides from The Pew Internet and American Life Project as a guide for how teens and young adults use mobile phones to participate in social media. They do a great job dispelling the myths and embracing the realities of how teens use the net via mobile device. 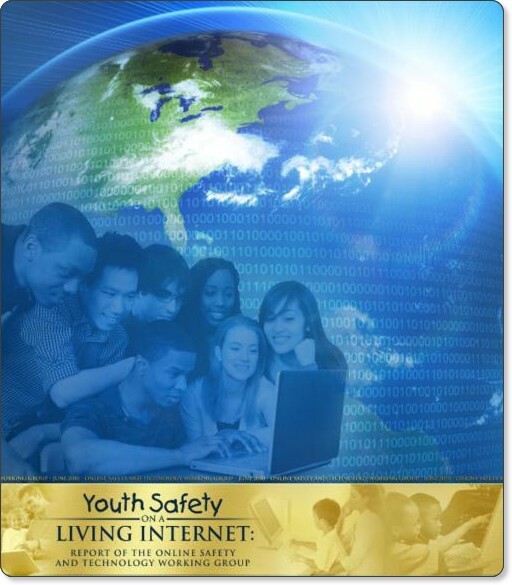 The “Youth Safety on a Living Internet” report from the National Telecommunications and Information Administration’s Online Safety and Working Technology Group, released Friday, June 4, advises that scare tactics related to online safety and blocked access to social networking sites is detrimental and does more harm than good to youth. The findings of this report bolsters the efforts of librarians and educators to fight restrictive filtering policies that block students’ access to content that can be used to help youth access, read, write, and interact with multiple forms of media via the web. 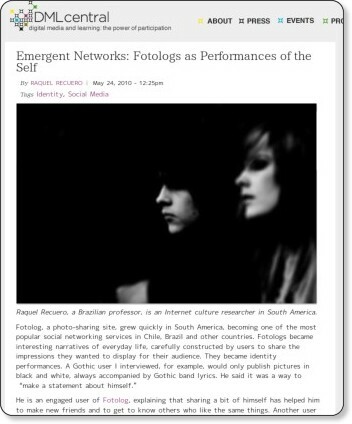 “Emergent Networks: Fotologs as Performances of the Self” at DMLcentral describes this social networking site that blends social media, photographs, and text as a means for connecting, telling the story of self, and engaging in narrative performances. Blog post author Raquel Recuero describes Fotolog as ” a photo-sharing site, grew quickly in South America, becoming one of the most popular social networking services in Chile, Brazil and other countries. Fotologs became interesting narratives of everyday life, carefully constructed by users to share the impressions they wanted to display for their audience. They became identity performances.” How might we as librarians and libraries help our patrons use a resource like this for storytelling and narrative? another interpretation is that teens actually have more access and more informal, casual contact because of texting. This is because texting is woven into the flow of other activities. In essence their friends are always there and always available for a texting “chat.” This interpretation follows from the material on texting in class, texting at night, and in a variety of other situations. Rather than becoming monks sitting in their cells, the material may actually point in the direction of more social interaction, not less. 52% of schools said they prohibit any use of social networking sites on campus. Some districts are working toward making those sites more accessible to students, but they need an educational justification to do so while ensuring usage won’t be abused. Many states have laws giving schools authority over off-campus conduct if it disrupts in-school instruction. Francine Ward, a California-based lawyer specializing in social media issues, expects the number of cases involving social media use and schools to climb in the next few years. The best way to get ahead of this is to amend every school’s “Code of Conduct” to include online activity, if only to have a policy in place when something does erupt. Adding social media policy to student handbooks sends a message that schools take online usage seriously. A 2009 survey commissioned by PBS shows digital and social media use by teachers is on the rise, but social media usage in classes lags behind other types of media. While 76% of American K-12 teachers say they use digital media in class, only 29% say they use a social networking site or social media community for instruction.